In monotheistic faith societies, as a result of mass migration, the religious venues are used by the other faith after adaptation and restoration of the building. This is a common practice worldwide. There are examples where the conversion process is made more than once. In Canada, a Catholic church in Sydney, Nova Scotia was converted to a mosque. In Portugal, during the 12th century the Mertola Mosque was converted into a church. In Spain, the Mosque-Cathedral of Córdoba Catholic Christian Church (1236) was converted into a mosque. 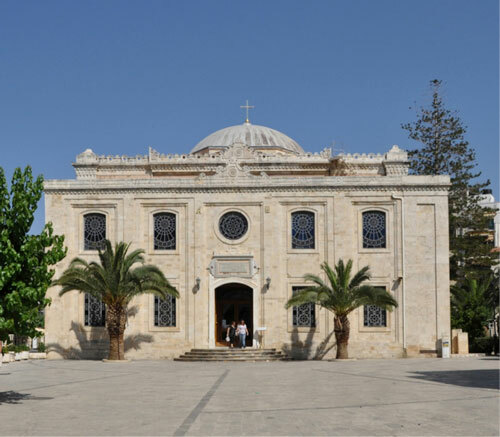 On the Greek island Crete the Agios Titos church originally was a church (62), then was rebuilt as a mosque (1856), then later used as a church (1923) again (Figure 1). Nowadays, in some places there has been news that the pastor of the church has opened the doors of the church to the Muslims in the area at certain times for worship. 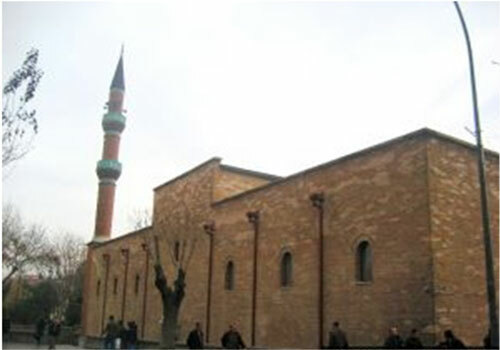 In Ankara, Turkey, in 2008, the Dogramacizade Ali Sami Pasha Mosque has been designed for different religions and beliefs of Christians and Jews to worship. These venues serve similar purposes, because of the different methods and local traditions they are different in size, architectural form, and use different interior materials. Because of the architectural design practice, the volume of the mosques are smaller compared with the churches of similar capacity. One of the main reasons for this is the understanding of modesty in Islam. In the end, no matter how large the mosque, there is an effort to emphasize the human proportions. The best examples of these are Mimar Sinan's Süleymaniye and Selimiye Mosques. Although the mosques are very high and large, they are lower closer to the entrance. In the Churches, to show God's greatness and awe the high ceiling forms are preferred. 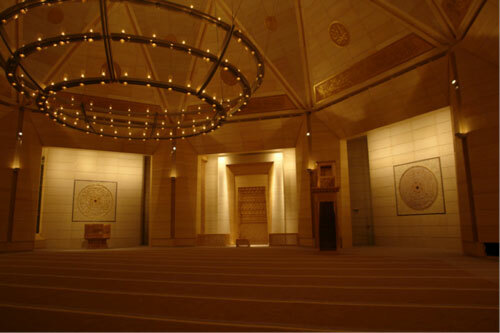 When the interior acoustics of mosques and churches are analyzed it has been found that for the sermons and preaching in mosques to be understood, for listening hymns, mevlids with musical features, and to hear the imam's recitation of the prayer in congregation the interior acoustics is very important. In every corner of the mosque the sound should reach approximately the same level and intelligibility. 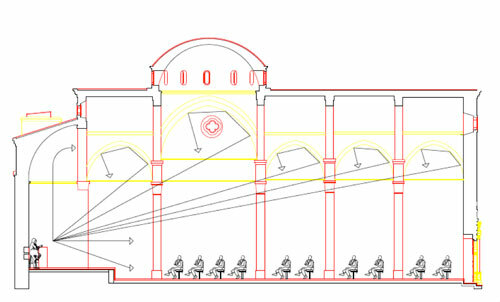 In the churches, it is preferred that the interior Reverberation Time (RT) is long because during the rituals in the Church, organ and piano are used as instruments, accompanied by the chorus and the congregation. 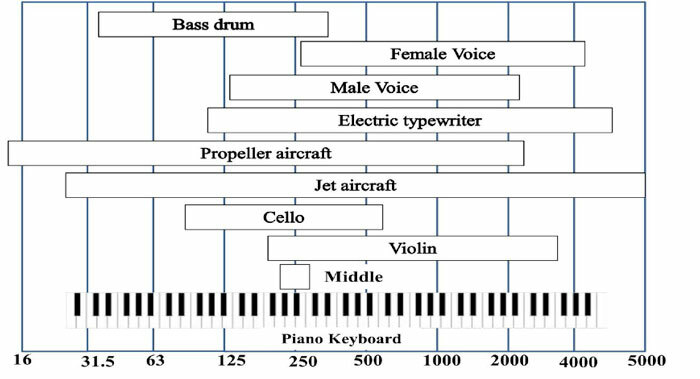 Figure 2 shows the comparison of frequency for some common sounds with a piano keyboard (Cavanaugh, 1988) and Figure 3 shows the Optimum RT for some facilities. Figure 3. 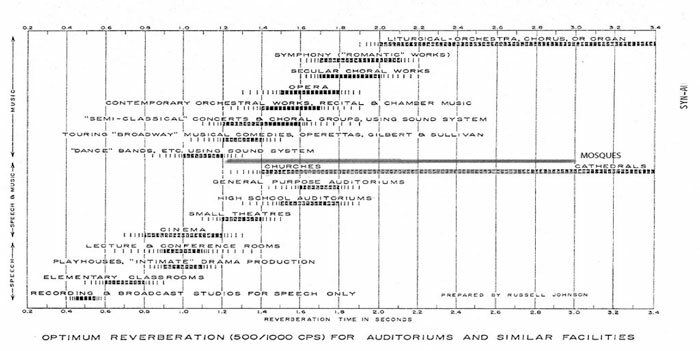 Optimum Reverberation Times (at 500 Hz and 1000 Hz CPS) for auditoriums and similar facilities. 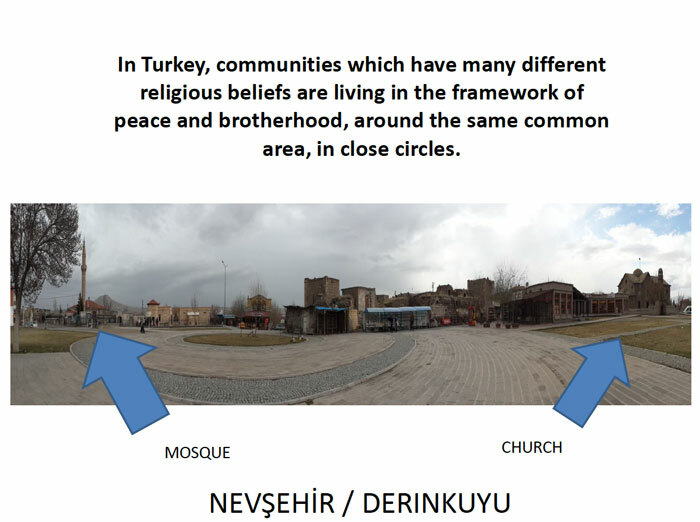 Figure shows differencies of mosque and church RT. 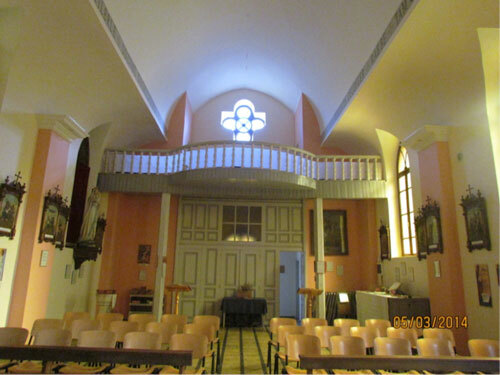 In the church, the congregation prays standing and has wooden seats. 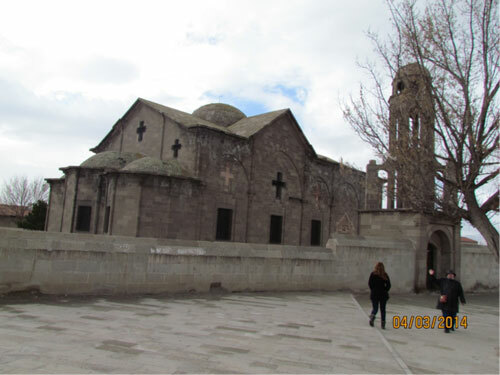 The church has hard surfaces in the environment creating longer RT. 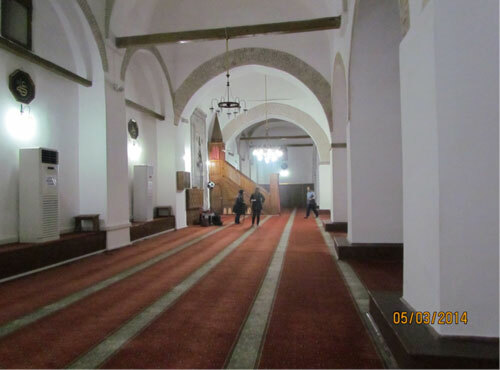 However in the mosque, people pray sitting on the floor using carpets and soft materials on the floor; the heavy use of soft materials in interior creates short RT. In addition in the interior of churches, sculptures and reliefs have been used, which shorten the RT (Figure 4). As in the case of mosques, in churches the pastor's speech should be heard by the entire congregation, and the interior form of the church should provide audibility and intelligibility. The differentiation of these religious practices also affect the required RT. 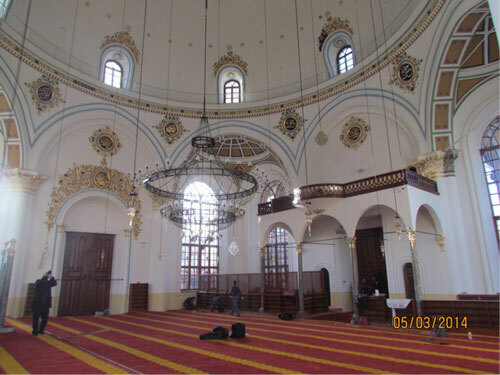 Especially for the mosques and churches built in the 1800s, because of the lack of electronic equipment, more effort was given to the balance of the interior acoustics and sound propagation the voice of the imam and the pastor could reach everyone in the congregation. 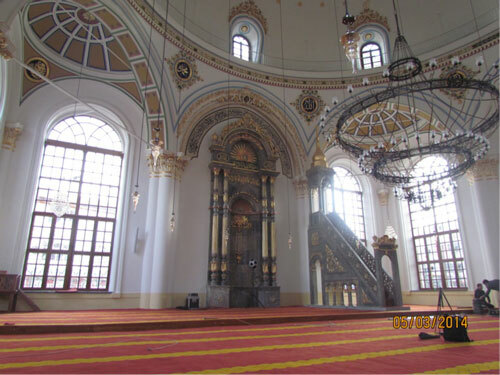 The best example of this can be seen in Turkey in St. Sophia church and in Architect Sinan era mosques (Figure 5A and 5B) such as Üsküdar Mihrimah Sultan, Süleymaniye, Cenâbî Ahmed Pasha, Rüstem Pasha, Sokollu Mehmed Pasha and Selimiye mosques. 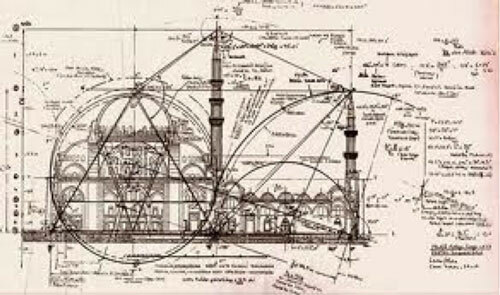 When we examine the St. Sophia (Hagia Sophia) church and Sinan Mosques we see great similarities in the plan form and cross-sections. 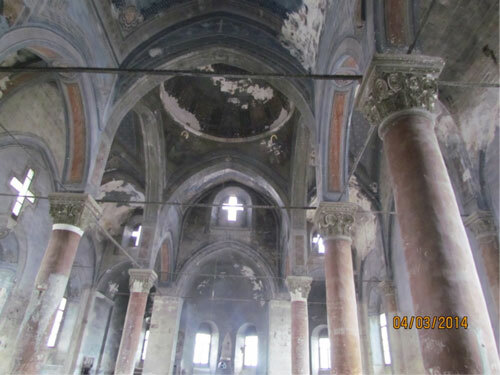 The difference in the interior acoustic in St. Sophia's church is the long RT due to its church properties. 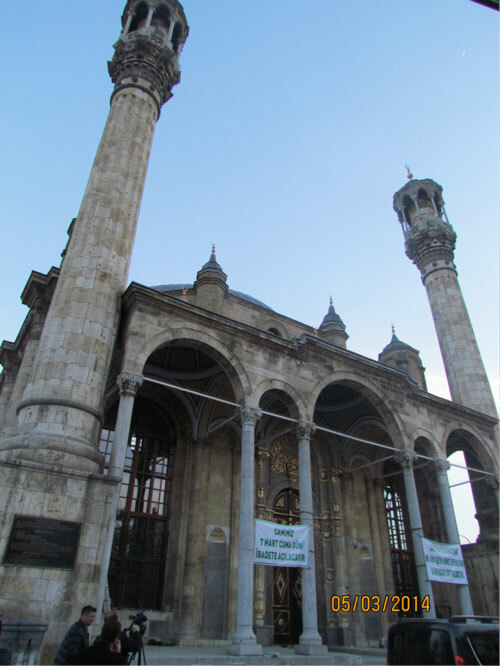 In Süleymaniye and Selimiye Mosques because of their mosque properties, the RT in this large volume is adversely affecting the interior acoustics As a solution to this, the architect Sinan has used clay water jugs which are defined as cavity resonators today. 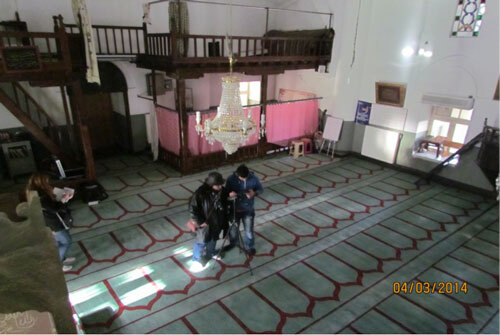 In relation to this subject many studies are carried out under the Conservation of the Acoustical Heritage by the Revival and Identification of the Sinan's Mosque 'Acoustics (CAHRISMA) organization. 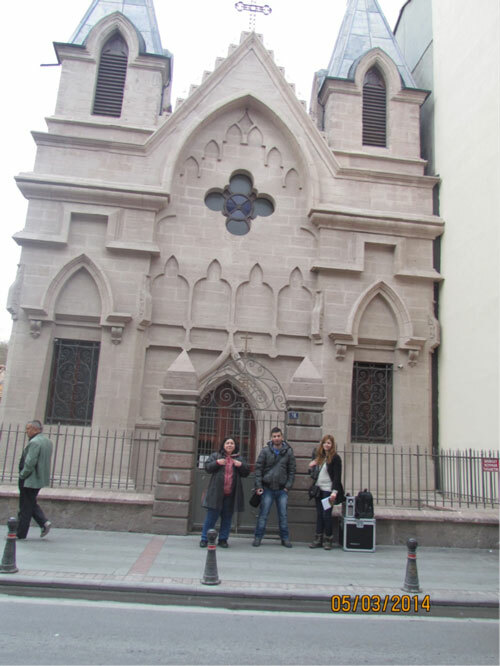 In the research, buildings belonging to different religious in Turkey have been chosen. The RT and sound propagation characteristics are examined and the effects of the differences of form, material and function have been evaluated. 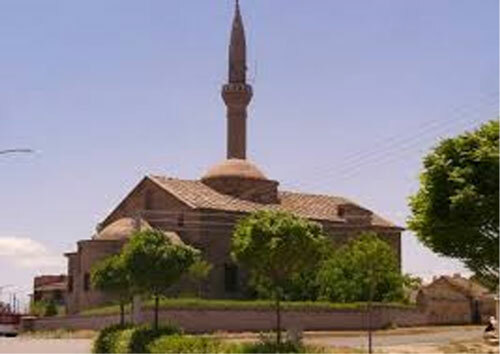 To reach this goal, sample mosques and churches built in different periods and made with different materials were chosen. 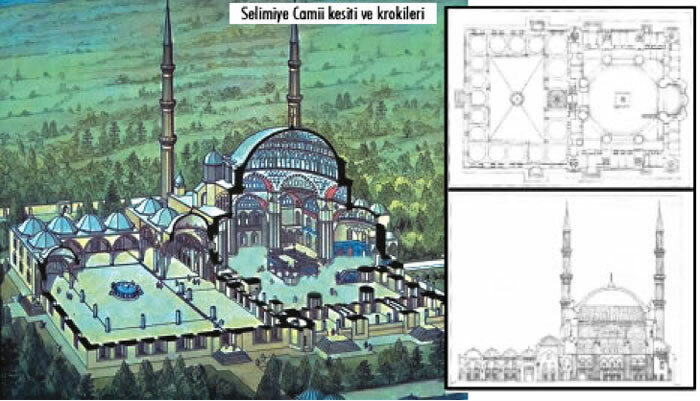 The plans and projects of these sample mosques and churches have been examined and the RT was measured and compared. 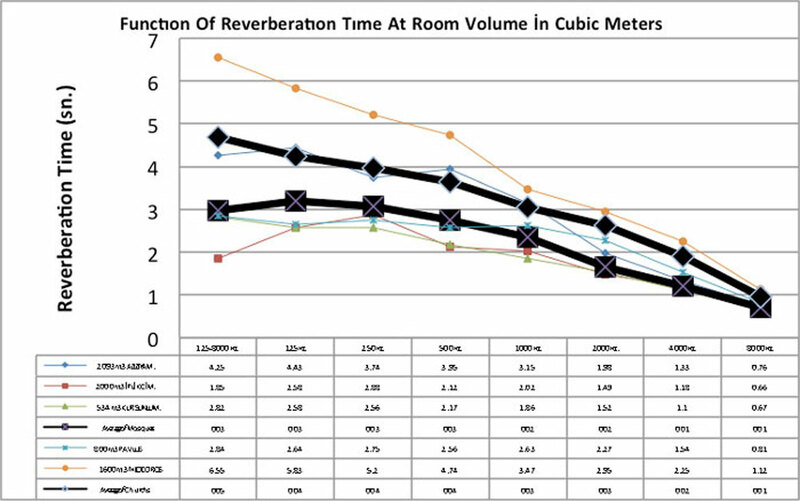 Early Decay Time (EDT) and T-30 (T60 equivalent) are taken into account by comparing measurements of Reverberation Time RT60 was made to reduce margins of error. In the comparison, the functions in these interiors are evaluated (Figure 6). Figure 6. 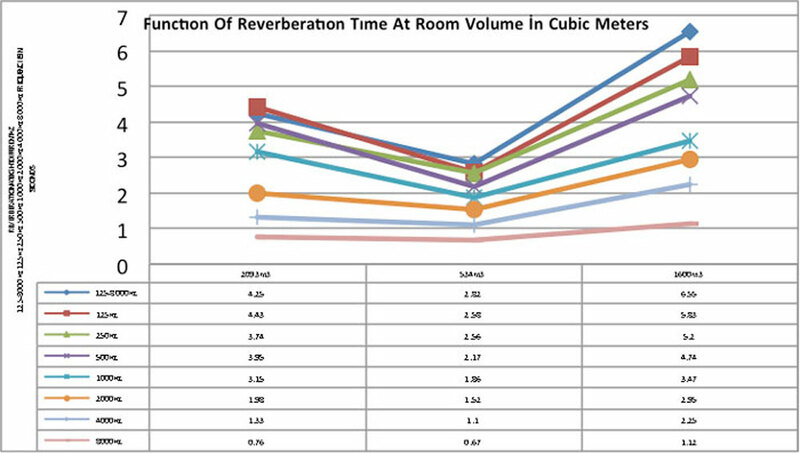 Function of reverberation time at room volume in cubic meters. Evaluations show that the medium frequencies are more intense in mosques because of human voice. In churches, with the addition of the liturgy in the church choir area it has been found that the intensity is in high frequency. For this reason the interior frequency has been found to increase. In this research, churches with cross and basilica plan types, and mosques with square plans are examined. It has been observed that in traditional mosques the circular roof types, and in the churches roof with sharp forms are preferred. According to research, in small mosques due to modest height on the buildings the RTs are achieved to be between 1-3 seconds. However in wide mosques, since the volumes are very large and the RTs are long, different solutions have been used. Especially, the architect Sinan has solved this problem with cavity resonators. 5. 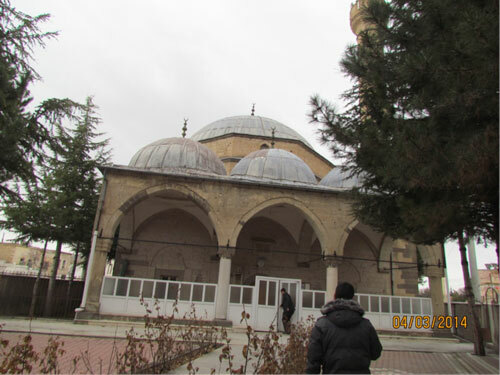 Iplikci Mosque, Konya: Remaining probably from XII. Century. 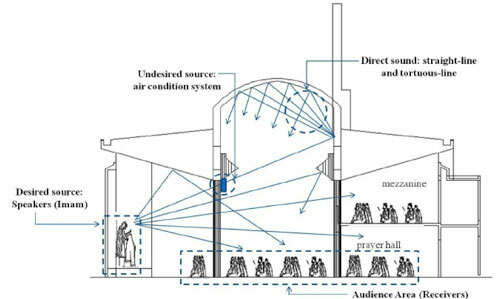 (Figure 11) This mosque is one of the best examples of Islamic structures from the acoustic aspect. Especially the clay water jugs are used in interior acoustics to provide control inside the walls. This was before the emergence of today's Helmholtz resonators, which are used with the same purposes are examples of cavity resonators. Other mosques and churches are researched from literature.